Aigredoux prides itself in the art of bespoke, allowing its customers to truly explore their way of life. Our linens are hand-fashioned and we are proud to be one of the last artisanal brands that still maintain a workshop in France. Over multiple generations, our artisans have passed down their knowledge ensuring exacting quality. This true craftsmanship has been appreciated around the world by luxury hotels, yacht and jet owners, as well as discerning private clients. Our online showroom and configurator exhibits a wide choice of fabrics, in terms of quality, material and color, as well as many of our hand finishes, from bourdon to ladder stitching. Any size, shape, or quantity is possible, ensuring that the only limitations are those of your imagination. The predominant choice for bed and table linen is cotton, which we pridefully source from around the world seeking out the highest quality. Cotton percale - a flat, closely woven and combed fabric that is often chosen for its breatheability, lightness, and crisp touch. Our Percale is 100% Egyptian cotton and is available in 210 thread count, while our Prestige Percale ranges from 400 to 800 thread count offering the ultimate luxury. 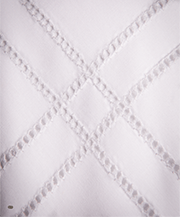 Cotton sateen – a fabric that is made using a satin weave structure, with spun yarns instead of a filament. The appearance often has a subtle sheen and is often chosen for its exceptional, silky smoothness. Our Sateen is 100% Egyptian cotton and is available in a 200 or 400 thread count, while our Prestige Sateen ranges from 400 to 1,200 thread count offering the pinnacle of cotton indulgence. Linen – one of the world’s strongest natural fibers, linen comes from the same flax plant as cotton but often includes thicker fibers. It has a more natural and rustic character, while known for being absorbent, breathable and particularly cool in hot weather. Embroidery – from initials to crests, and emblems to names, almost anything is possible in any colour and in any location. Bourdon stitching – a tightly spaced decorative stitch which is often used for embroidery or linear detail, such as lines or squares. Ladder stitching – a traditional and elegant detail that very few artisans know how to do properly. This technique actually includes spreading and sewing the fibres of the cotton to create the appearance of a ladder. Enclosures – whether you prefer buttons, zips, folds, or a combination, any and all are possible. We recommend always using a tape measure when determining dimensions. It is advised to add at least 30 cm to the duvet cover dimensions (on three sides sides) to avoid the mattress being shown. For sheets that are to be tucked in (rather than fitted), we recommend adding 50 cm, on all sides.